Journey into space – on a Noddy bike! Riding along the alleyway that runs between the back gardens of Haws Lane, the back of Haws Down School and the railway line, in the dead of night at around 25mph, headlamp just about lighting up the path ahead, there was no sign of my colleague following. The fences on both sides were flashing past about a foot away from the handlebar ends when suddenly the rolling tyre noise just stopped dead! Total panic. What had happened? There was no time to think. Then came an almighty crash and the headlight died. Total blackness! As a reminder of his patrolling days, the writer still owns this former police LE. 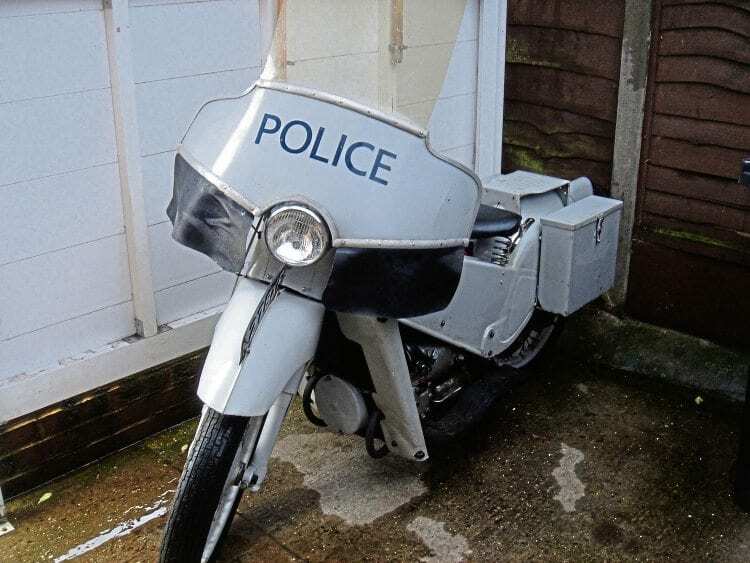 I’d been riding the police LE Velocettes around Beckenham’s ground for a couple of years, having been lucky enough to pass a riding test before being allocated a lightweight motorcycle course at Hendon to sort out my bad riding habits. It’s surprising how quickly they return! Ron had been transferred to my relief at Beckenham from an inner division, and as he was a motorcyclist, he also passed a ‘Noddy’ test. We took the same route to work every day on our Honda 50s, and often ended up in a minor ‘burn-up’ that Ron always won, as his Honda was a bit faster than mine, despite my futile attempts to ‘tune it up’ a little. We were on nights, and I suggested that I could show Ron some of the back streets of the ground, including the many alleyways and footpaths that criss-crossed the area. We set off on our Noddies, myself in front, and after exploring several of these little-used back ways we headed for West Wickham, where I knew of a long alley that ran behind a school and the back gardens of some houses. We often ventured there to check for any suspects loitering around. Read more in the May 2018 issue of OBM – on sale now! Next Post:White knuckles, girlfriends and oily wrecks!